ALL OVER my new, white sofa! These are the only two photos I had the presence of mind to take. (it was much worse than this). I've only had this sofa for like, 2 weeks. I was just about to leave for school. I was in a tizzy. I was having a fit. We pulled all the slipcovers off the sofa. and we scubbed and we sprayed. My husband and daughter spent the morning washing the slipcovers, and hanging them to dry. for a few last minute items we needed wanted. So this is what I came home to. Even the table was covered in clutter. And I am a clutter-hater. So now, the baking will have to wait. I have to get this place whipped into shape. First I'll put away the groceries. Then I'll tackle the dishes. And clean up all the clutter. Then those slipcovers need ironing. Then they go back on the cushions. And realize how much I have to be grateful for. to all my friends in Blogland. if you just take the time to see them! oh my everything about this post speaks to me. Girlie, I've so been there!! What a day you've had, but you have a great attitude at the end of it all! I know you'll get things tidy and ready to bake. I love that quote and enjoyed reading your thankfulness list to the Lord. Hi Leslie, The stains all came out and the sofa looks as good as new! Groceries are put away, dishes are done - and baking is waiting until tomorrow! Happy Thanksgiving! Hi Diane, Good thing the Shout and the bleach worked, because a throw would not have cut it. Megan had her full cup of coffee on a wooden tray that was on the ottoman. She pulled the tray and the wood caught on the fabric on the ottoman and the cup went flying. Splatters covered the sofa! But the day is over, and family is intact, and the stains came out!! Happy Thanksgiving Diane! Blessings and have a great Thanksgiving. My kids are grown so I can tell you, you will miss these days - lol - believe it or not. I think you handled things great! 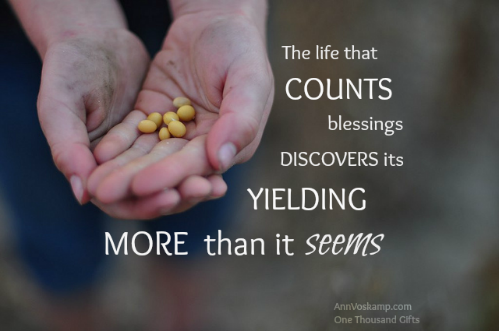 What a great post~count your blessings indeed! I am sorry to hear about your sofa. What a great husband you have! Have a happy Thanksgiving! I am grateful to be home from teaching so I can spend time with my daughters and my family! OMG, I would've yelled some expletives!! LOL! Accidents happen but when you're in a hurry they are all the worst! Did the coffee come out? Get a travel cup so there are no more spills ;) Hope you had a GREAT Thanksgiving!